Writer’s update: Thank you very much to everyone who donated money for the health check of Fu. See the full details below. So saving an animal is another “first” on my Beijing experience list. Even though I love dogs, I’m very reluctant to foster or adopt one, because of the many considerations when owning animals in the city. 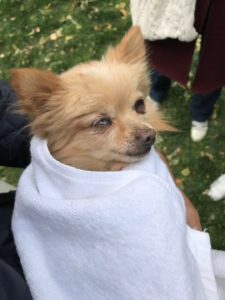 But that changed when I stumbled upon a visually impaired Pomeranian, limping across the very busy thoroughfare of South Sanlitun Road (the street across from Taikoo Li). I’m no stranger to rescuing animals – mostly dogs – as back home, our family has adopted at least three askal (Filipino for “mongrel dogs”), and considered them as our family members. 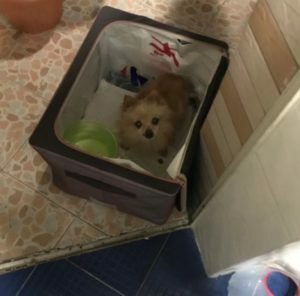 It helped that I’ve been covering pet and animal stories for beijingkids so I have some idea how to do a proper rescue – but of course, things get different when you’re in the middle of such situation. I had my weekend all planned: visit a colleague who was debuting her excellent pottery at a weekend fair, and go for a bike ride before attending a gala. On the way to that fair, there was a commotion on South Sanlitun Road. There was a nuisance hindering foot and vehicle traffic: a little yellow dog that was running aimlessly and alternately across the pavement and on the road. Some pedestrians stopped to take photos of the cute but meandering dog, while motorists just honked and shouted. The commotion had been going on for a good five minutes and hardly anybody, save a local lady who appeared as worried as I was, was trying to catch the animal. At that moment, I decided I couldn’t leave the animal behind. So in a scene reminiscent of a TV drama, I rushed to the middle of the road and stopped the cars to drive the dog to the pavement where the local lady was. Once the dog was safe, the lady tried to grab it but to no avail. We both managed to corner the dog in the parking space of a restaurant, and there the lady once more tried, this time offering it a strand of her noodle dish from a dabao box she was holding. Again, it failed, and instead drove the dog towards the garden of a residential compound. This time, I sought help from the International Center for Veterinary Services (ICVS) because I, too, was at a loss about how to rescue it. They suggested giving a small piece of food to lure the dog. But I didn’t have any, so I tried another way to get it. The dog kept running until it collapsed on the grass, panting and visibly weak. Using my broken Chinese, I told the noodle lady that I would hop into the garden and get the now-shaking dog with my gym towel. Two female pedestrians saw what I was doing and tried to help us. I was able to get hold of the dog, and realized she had an aluminum wire coiled around her head. What it was for, I don’t know, but I thought it was rather a strange leash. I wrapped the towel around her and went back to the pavement, where the noodle lady and two other onlookers breathed a sigh of relief. The wire wasn’t choking the dog, but it was still a strange leash (photo 1). Her eyes are also cloudy from what I suppose as a cataract (not visible in photo 2). One of the ladies suggested we bring the dog to a vet, while another asked me who would take care of it. At that moment, I decided to take care of her, for the time being at least, because I felt she was either lost or abandoned. We brought the dog to a nearby pet clinic at Sanlitun Soho, where a vet removed the aluminum coil and told us the dog is around 8-9 years old, has something on her eyes (a cataract, I suppose, because of a cloudy gray patch on her both eyes), and needed a checkup. One of the ladies, who spoke English, asked my opinion, though I told them that I would take her to another vet just to be sure. The noodle lady wanted to keep the dog but explained she’d never had a pet before. In the end, the four of us agreed that I would take the dog home, and the others asked me to update them on what happens to her. At home, I gave her water, which she gulped really fast, and made her a temporary bed. My housemate was gracious and bought her dog food. I spent the whole night thinking about the dog, which I named 福 Fú (“blessing”). The following day I brought her to ICVS in Wangjing and had her checked up. The vets ascertained Fu is around 10 years old based on her teeth and her bone condition is still good, despite being old. Her blood tests returned normal (that’s good news! ), though the vets cautioned me that she might have not been vaccinated or neutered. 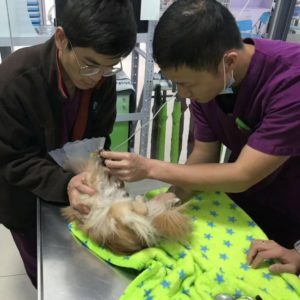 Her teeth have also some form of decay, which the vets said could be a reason why she couldn’t take in enough food, resulting in her low weight (around 2 kg). At the moment, Fu is at home and recovering from whatever trauma the rescue may have caused her. But I’m sure she’ll be alright. Writer’s disclosure: I’m appealing for any kind of help for Fu, especially for her vaccinations and health and dental checkup, which are costly. 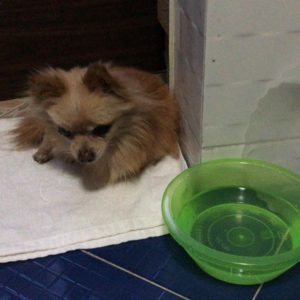 It can be very difficult for families who want to adopt animals like her without knowing her full medical history, so I’m spearheading a fundraiser to make sure she’ll stay in good health until we either find her owner(s) or her new loving family. 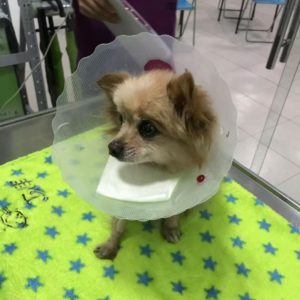 My target is to raise RMB 1,100 for the full checkup and blood tests and her other needs, and any amount exceeding that goal will be donated to other rescued pets in the city. If you wish to send any amount, please scan the QR code below. 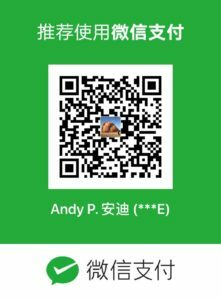 Nov 19 update: At the moment, I received RMB 400 worth of cash transfers from seven WeChat donors and RMB 2,700 in donations from a fundraiser organized by ICVS. We’ve already used the RMB 400 donations to pay for Fu’s blood test, which turned all good! Meanwhile, ICVS said one of their clients made a donation that covered Fu’s adult dog vaccination package. Any amount that we will raise from now thereon will be donated to other rescued pets in the city. I would like to thank everyone who helped pay for Fu’s medical needs, as well as to people who gave their well-wishes to Fu!